MARCH MADNESS! – Part V – *"Let’s Go to the Videotape…!" 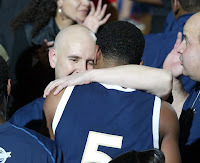 After a much needed full day off yesterday, I’m finally getting around to harnessing my thoughts on Friday night’s State Quarterfinal games over in Westchester; including Will Bouton’s heroic heave that gave Newburgh Free Academy their one point win over longtime rival Mt. Vernon. In making those images, most of it still remains a blur in my head. Just before Kadeem Dinham (#24 in white) of Mt. Vernon scored off an offensive rebound at the other end of the court, giving them a two point lead with 1.8 seconds left, I do remember sliding over closer to the basket and resting the “long” camera with the 300mm along the basket stanchion; as I wouldn’t need that camera anymore to shoot downcourt. I’d already made what I thought might be the game winning image of him banking in the putback with the “short” camera, including a complete view of the scoreboard. (this is the similar look of Minisink’s Stefanie Dolson missing a one & one from the line, with the scoreboard showing 1.1 seconds remaining. Even though she had 36 of their 44 points, that image told the story of their loss a week earlier.) Mt. Vernon players began to cheer and fans streamed onto the court. Newburgh had called timeout though, and .2 second was put back on the clock. The court was cleared and now there were two full seconds remaining. A lifetime by NBA standards, and my experiences. I didn’t figure it’d be over for NFA or anything. I wasn’t upset, I wasn’t shocked. It was just basketball at it’s highest level – in this case an extremely important HS Playoff game for the kids I’d been covering all season. I do remember now that everything sort of went quiet inside my head. It was kind of weird actually. I was truly “In the Zone” and nothing else mattered. I’d worked extremely hard all season – purposely installing multiple strobes at just about every HS game I’d covered and at some of the bigger games, utilizing three and sometimes four cameras. Just last weekend I’d installed a backboard glass remote camera & the following day a remote in the stands at a different venue, aiming that camera back down toward the basket for a different view of players going to the bucket. With my years of covering NBA and major college games in the NYC market, all this proved to be added experience, combined with an intense patience and timing, as I knew I was about to take a measured breath, and sight-in on this last play. I don’t know if I looked for the inbounds pass from the other baseline or if I was just “keyed” on watching Bouton. All I knew is that I was “on him” through the camera, saw him clean with the defender all over him, and fired! One shot. From my knees. On arena strobes. BANG!!! All bedlam broke out as the crowd erupted onto the court. There was no way to avoid being run over, so I headed for midcourt. Never saw Bouton until I made my way up into the stands to try and make images of the “Jubo” (Jubilation of the players going nuts…) All I had in my hands now was the “short” camera with the 70mm – 200mm lens, and that view would be too tight for me to be in there with the crowd mixing it up with the players. The only wide angle lens I’d brought into the building was securely clamped in the basket stanchion padding as a remote under the net. That camera view proved itself again, as I’d made nice game images from the earlier Kingston girls defeat over Mt. 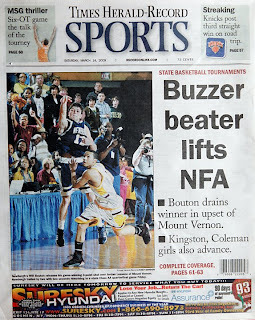 Vernon (right) and the wonderful image (top) of Bouton’s shot pasted in the net, with Mt. Vernon’s Dinham (#24) looking up at the ball in shock. 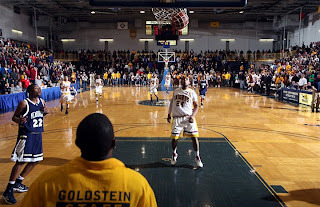 I don’t remember at all how I fired that remote camera – but I do vaguely remember seeing a bit of the ball in mid-air heading for the backboard, and careening into the net. If you click the image & look closely at the frame you can see Bouton now seated on the floor past half court at left and even 0.0 on the game clock above the far basket. Game Over! Everything imaginable worked out in covering those two games. As I mentioned in the earlier game post below, I’d arrived early enough to learn that the college had arena strobes, and I could utilize them for the games. There was wi-fi in the gym for media, meaning we could work at courtside. There was plenty of room for photographers and “tee-vee” cameramen along the baselines and the bathrooms were close-by. A “best-of” slideshow highlighting my coverage of this month’s coverage during the past 10 games of HS Sectional and Regional Playoff games is coming real soon… Promise. Now on to Glens Falls, NY next weekend for the HS State Championship tournament games. (*Fingers crossed.) -cg. This entry was posted on Monday, March 16th, 2009 at 3:06 PM. It is filed under Assignments: and tagged with basketball, location lighting, pocket-wizard, remote, sports, strobe. You can follow any responses to this entry through the RSS 2.0 feed.